7 double effect airbrushes in one ! - Every sphere requiring airbrushes is covered, a single device allows to satisfy every possible need. - The assembly is facilitated whilst also eliminating the constraining nature of cleaning. - By the ingenuity of its conception and the precision of its fabrication, it is easily used with the most difficult painting. - The originality and the flexibility of its reduction axis allows a wider spraying range whilst a michromecanics assist in ensuring the consistency of the line. - It innovates by its shape, its aesthetic. It combines handiness and lightness, ensuring the artist greater comfort. All of these improvements contribute in making the Airbrush an innovating product, perfect for both professionals and beginners. Moreover, the head, totally independent of the air-painting mechanism (which is integrated to the body) is straight forward to clean. The manufacturing of the cap and the nozzle is done with tolerances inferior to 5 micron, ensuring a perfect centring and the interchangeability. Made of nickel-plated aluminium, its prismatical shape results from an important erganomical study. Its smooth and appealing shape give the product a very appreciated aesthetic. Moreover, it satisfies both usefulness and pleasantness as it eliminates the hardness provoked by long and tedious work. It has been thought to satisfy Airbrush marathon runners. It is available in 2 versions ; one with a needle screw adjustment. The other handle is a basic one. Both of them are made of anodised aluminium. The standard colours available are blue, red and black. Multicolour marble design decorations are available for people wanting to personalise their Airbrush. PTFE is currently one of the most effective material, resistant to acids and solvents. 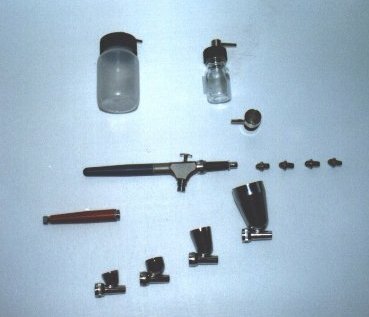 PTFE head : the removable jar airbrush’s head is manufactured in this material. When you remove the cap and the nozzle, only one piece remains. The same operation on a metallic head shows a PTFE removable join. The needle and nozzle joins disappear.